For our long weekend getaway, we decided on Bridgetown. We had visited many years before and remembered a quaint town with awesome food at the local pub. It was time to return, spend some time checking out the area and make sure the pub food was still awesome. Bridgetown is two and a half to three hours drive from Perth at approximately 250km. We skipped the crowds and left at lunch time on Friday to arrive mid afternoon. There are plenty of places to stop on the way, whether you want to call in at Settlers Roadhouse or find somewhere for a late lunch further along the track in Donnybrook or Balingup. Bridgetown Caravan Park is easy to find. Drive through town, cross the bridge and it’s on your left. Next door is a bowls club and there was plenty of action over the weekend. We were greeted warmly by the owners and after a quick chat, given direction to the camping site. On our way home, we took South West Highway. Although a little longer, it’s a nice drive and its takes you through some scenic towns. A good option if it suits you and the upgrades to Tonkin Highway make it a smoother run once you’re back in the city. We were lucky to arrive before the crowds and took our pick of where to set up. The tent area – or overflow – is a flat surface which looks like it was once part of the bowls club. There is still some grass so you’re not setting up on dirt but it’s not a plush, green carpet either. One downside is the area is quite open so you will get some sun from late morning and during the afternoon. We chose a far corner, overlooking the river and next to the local park. The caravan park facilities are a bit of a walk. However, the community park facilities next door are close by. The showers and toilets are not new, but they’re clean and they work. There’s plenty of space for kids to play and ride their bikes and the community park has a playground. It’s also easy walking access down to the river. We could walk out of our camp and down to the path which takes you along the river. The region is rich with places to go and things to do. With only two full days, we had to limit ourselves to what we could explore. On our first day we walked the Blackwood River Walk into town. The trail takes you along the river and as you leave behind the commotion of the caravan park, it becomes a peaceful stroll through the bush. We saw plenty of bird life, including a western rosella, although it was keen not to have its photo taken. Eventually the trail ends and directs you uphill and takes you back into town, which was buzzing on a Saturday morning. There are several coffee places to choose from and shops to wander around. We had a cuppa at the Emporium. Sunday was a glorious day, weather-wise, and we were keen to do a bushwalk. After some research online, I discovered the Bridgetown Jarrah Park. The park is a short drive out of town, set in beautiful, dense forest. There are several walk trails taking you through the bush so you can choose a length which suits you. The trails are well signed but I recommend downloading the walk trails brochure before you go. The brochure also contains information about other trails in the area, including the Blackwood River Walk we did on Saturday. After our walk, it was time to make sure the Bridgetown Hotel was still serving a great burger. No, no, don’t thank us. It’s a community service. Yep, burgers were great and it’s still a lovely spot to sit out on the back balcony. There’s also accommodation available if the caravan park is not your thing. Markets are held at the community park every couple of weeks. Unfortunately we were there during an off week. You can check out which days these run on their Facebook page. You can’t go wrong heading out this way. 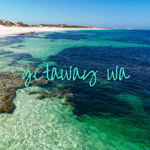 Bridgetown and nearby towns offer an alternative to the busy South West coastal areas of Margaret River during the long weekend and holidays. Not only are they quicker to get to, but they’re cheaper and offer bush and river experiences. Bridgetown Caravan Park is easy, clean and affordable accommodation. You couldn’t ask for more, staying right by the river and only a short walk into town. If relaxing away from the crowds is your idea of a break, Bridgetown is the place to go. You can find out more about the region from the Bridgetown-Greenbushes Visitors Centre.